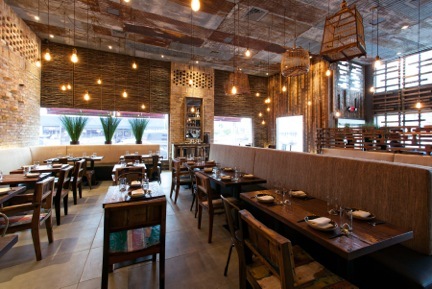 Khong River House is the latest creation from Miami restauranteur John Kunkel and his 50 Eggs restaurant Group. It is located just off of Lincoln Road in the old Stephen's Talkhouse and Miss Yip space. As most of you know by now, John is the founder of the popular Lime Fresh chain which he recently sold to Ruby Tuesday's. Subsequent to that he opened the critically acclaimed Yardbird-Southern Table & Bar on South Beach with a second outpost slated to open in NYC in the near future. 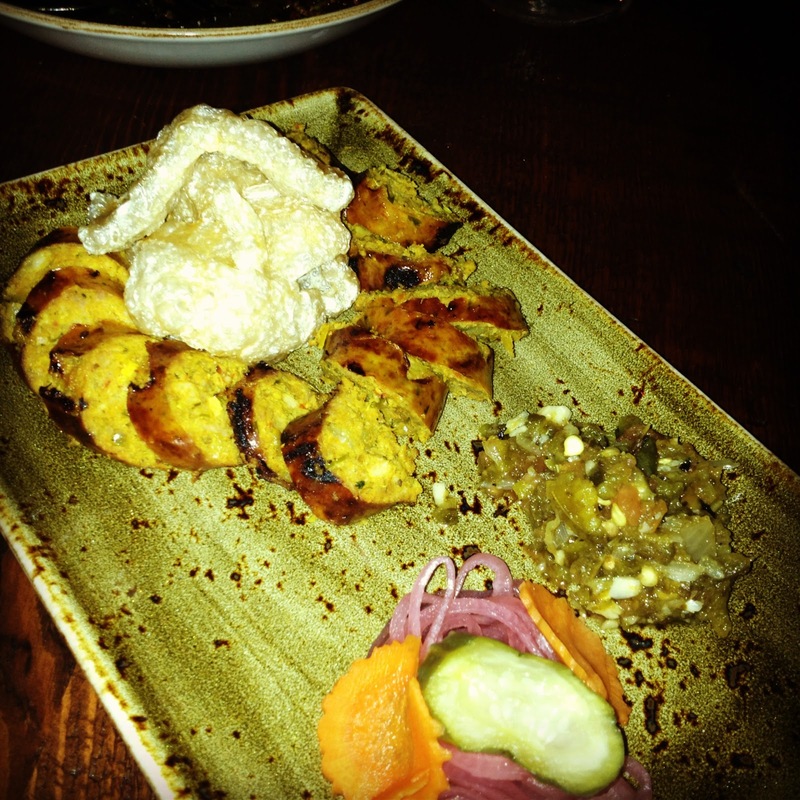 He is also expanding his brand to Coral Gables with Swine-Southern Table & Bar. I was a fan of the first spot he opened over on Alton Road in 2001, Taste Bakery and Cafe. When Yardbird initially opened, I posted some tweets questioning the authenticity of Yardbird and pointing out the obvious chain aspirations. If I recall correctly, I believe I predicted that there would be 10 Yardbirds by 2014. That wasn't meant to be a knock, rather an observation regarding John's business savvy and prior success. My tweets/comments surprisingly made their way to John. More surprising, was the fact that he took the time to reach out to me to discuss things. He invited me to meet with him over a beer or some bourbon to learn what 50 Eggs was all about. I never met with him but we did exchange several emails since then. I was very impressed by his hands on approach and the desire he had to deliver a first rate product. I was further impressed after receiving an email from him regarding his latest project, Khong River House. His excitement and passion for this project flew off the computer screen. 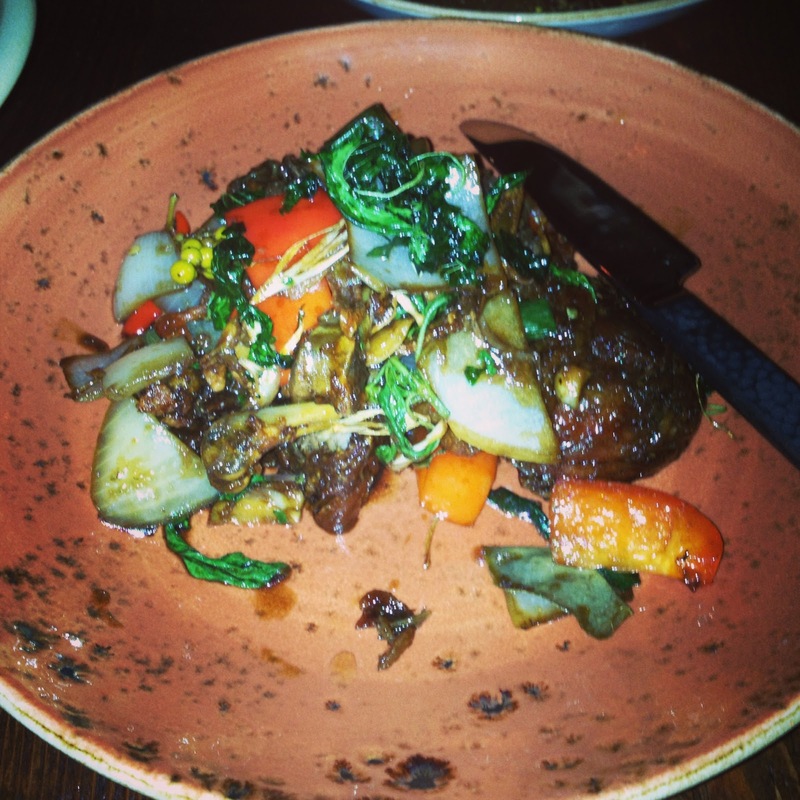 He raved about the talent and creations the chef and his team were working on. This wasn't a restaurant owner trying to sell a product. This was someone who was genuinely enthusiastic about it. It turns out that John spent several years living in the northern provinces of Thailand in his early twenties. While there, he fell in love with the culture and their cuisine. And he wanted to bring those experiences to Miami. He wasn't interested in opening a generic pad Thai parlor. In order to fulfill his vision, he teamed up with chef Piyarat Poltha Areerartn a/k/a chef Bee who grew up in a small town in the Chiang Rai region of Northern Thailand. Many may be familiar with chef Bee's food from his restaurant in North Miami, Oishi Thai. Here, chef Bee has created a diverse menu consisting of the authentic food from his home region. Chat Chow TV recently sat down with chef Bee. 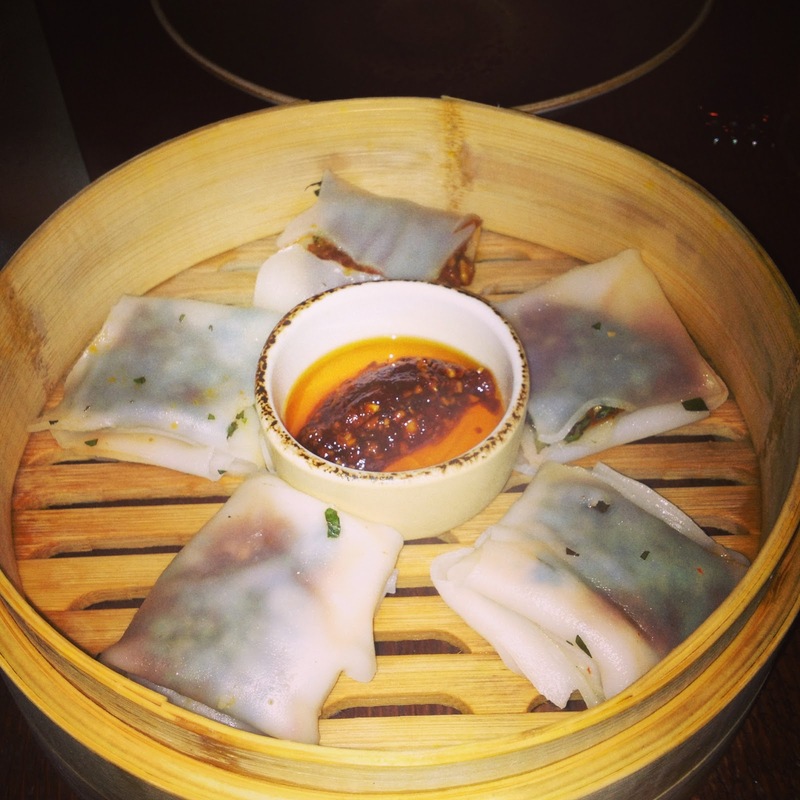 The dinner menu consists of small plates, salads, noodles, traditional dishes, rice and shares. There are a lot of interesting items throughout the menu and it will take several visits or a large group to tackle it. They also serve lunch which features several banh mi options. Brunch is starting this weekend and includes most of their lunch items plus the addition of interesting breakfast fare and buns. As soon as Khong opened, John emailed me inquiring when I would be coming in. He even offered to pick up the tab. He knew he had a winner. I didn't take him up on his generous offer because I wanted to give him an honest assessment. If the food was as good as he claimed, I didn't want my praise to be tarnished. To date, I've been to Khong two times and have tried several dishes. All have been very good too great. Chef Bee and his team are easily putting out some of the most unique Thai food in Miami. Food fans should make visiting Khong a priority. 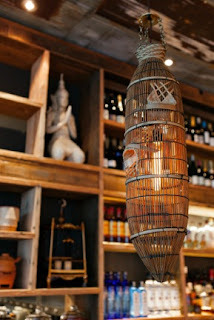 For those that are apprehensive about trying authentic Thai cuisine, I would encourage you to go with an open palate and sample some of the offerings. A successful and savvy business person with a passion for a project plus a talented chef cooking authentic cuisine is a winning combination. To date, John and I have never met but I have nothing but respect for him. Bird cages, signs of good luck in Thailand are seen hanging throughout the restaurant. The wine list and cocktail program is in the experienced and talented hands of beverage directors Allegra Angelo and Robert Ortenzio who you may recall from Michy's and Sra. Martinez. The cocktail menu focuses on gin along with house made bitters and various Thai ingredients. I've sampled a few drinks thus far and have been impressed. None have been syrupy sweet and all have had a nice spicy kick to them. I predict that the upstairs bar will become a popular destination for the cocktail appreciating crowd. Unfortunately on my first visit I ordered a bottle of wine that never arrived. By the time the waitress informed us that they could not locate it, we were already almost done with our meal. Service errors are to be expected early on and the waitress voluntarily brought us two glasses of wine and a dessert which was unnecessary but appreciated. The dining room was designed to mimic a traditional Thai home where bricks are spaced for ventilation. If you look up, you will notice that the ceiling is made of sheet metal similar to shanty homes. Pictured above is a private dining area located upstairs in the old Buck 15 space. The aforementioned bar area is also located there. The first dish to arrive were nicely textured house made Burmese noodle wraps. They were filled with tasty pieces of roasted dried red chili, roasted peanuts, palm sugar and lemon juice mixed with cilantro and culantro. One of my favorite dishes thus far is the house made Chiang Rai sausage. The texture and flavors were very enjoyable. Chef Bee's sausage contains pork with garlic, chili paste, cilantro, galanga, lemongrass, coriander root and seed, kaffir lime leaf and this soy. 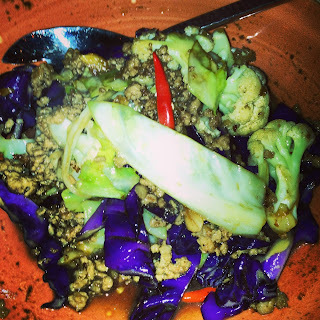 From the share portion of the menu, the cauliflower stir fry with cabbage, chilies, garlic and minced pork was a tasty combination that contained some nice heat. The northeastern style jungle curry was good but could have used more heat. It included thin slices of chicken in a red chili paste along with a rhizome broth. Young peppercorns, long green beans, baby corn, Thai eggplant, mushrooms and lemon basil leaves were fresh and plentiful. Thai sticky rice is the suggested pairing. Surprise,surprise! I loved the "prik" dish. Chef Bee's Thai crispy duck sautéed in young peppercorns, white onion, fresh chilies and basil leaves are a standout dish. The duck was wonderfully seasoned and perfectly crisp. The northeastern style shrimp salad features diced pieces of firm Florida pink shrimp tossed in a roasted chili paste with lemongrass, fresh lime and endive. The shrimp was very good but I could have used a little less of the paste which should be accomplished without sacrificing the heat. Another standout is the Boat Noodles served in a complex dark broth with braised beef, house made meatballs, Chinese watercress, dried chili, herbs and bean sprouts. 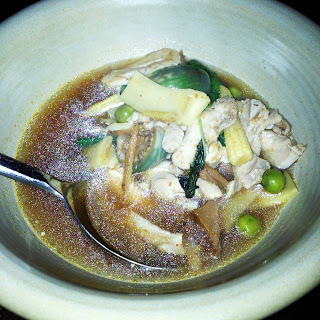 Although the broth wasn't overly spicy, it was full of delicious flavors. Thai homes have good ventilation. 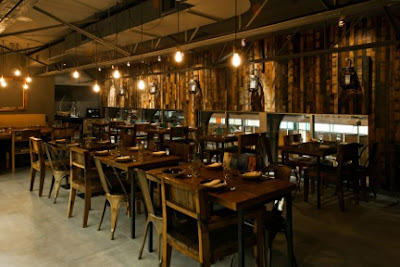 The style of their restaurant is perfect for me especially because they focused more on ventilation.